Back at the tail end of 2009, Mick McCarthy was roundly condemned for fielding a scratch Wolverhampton Wanderers side against Manchester United. 3,000 Wolves fans travelled a long way in the middle of the week with little change out of a hundred notes to see a reserve team whipped by the Mancs. McCarthy defended his selection on the basis of needing to protect his better players from the possibility of picking up an injury in a game they were likely to lose anyway. However, Come on the Déise is excited to able to exclusively reveal the real reason behind his reticence. Mick is a son of Tallow and he was channeling the spirit that saw Waterford take to the field in Ballyduff Upper yesterday with a less-than-summer-strength lineup. We don’t need no steenking full strength teams when we’re more than five hundred metres west of the Colligan, right? Okay, that really is the lamest link ever. Still, you have to wonder what we are meant to read into yesterday’s win over Cork IT in the poignantly titled Waterford Crystal Cup, giveitfong’s typically thorough match report notwithstanding. The chances of Tony Browne, Ken McGrath, Eoin Murphy, Seamus Prendergast and John Mullane not being first choice selections come the summer should they be available are slim to none – Big Dan won’t be a certainty, but that reflects the status quo. Players occupying their positions until March won’t have much incentive, and even if they are sensational how are the management meant to tell in such low octane contests like against Cork IT? Getting the right answers to these all-too-obvious questions is what separates the management men from the boys. Perhaps someone should ask Mick McCarthy. This entry was posted in Hurling, Waterford and tagged Ballyduff Upper, Cork IT, Manchester United, Mick McCarthy, Wolverhampton Wanderers on 18/01/2010 by deiseach. I needn’t have worried. Ballyduff Upper won the county championship for the third time when they beat Ballygunner in the final on score of 1-18 to 1-14. I didn’t get to the game due to a prior engagement – the graves, if you must know; another reason for getting the county championship out of the way before November – so heard a valiant rearguard action on WLR as Ballyduff defended a seven point lead in face of an onslaught led by Paul Flynn. You knew it was going to be Ballyduff’s day when Tom Feeney saved a typically brazen long range goal effort from a Flynn free. Ballygunner did trim the lead to as little as two points as Stephen Power pounced on the rebound after Flynn’s goalbound effort had been saved – sadly I am not getting paid per Flynn reference – but Ballyduff held on to win the county cup for the first time in 20 years. Some turn around from being an intermediate team just two years ago. And they have little to fear in the Munster championship. If this thread on AFR is to be believed, there isn’t a single previous winner of the Munster title left in the competition. Not that they should be too worried after their heroics in the county. Well done to Ballyduff. 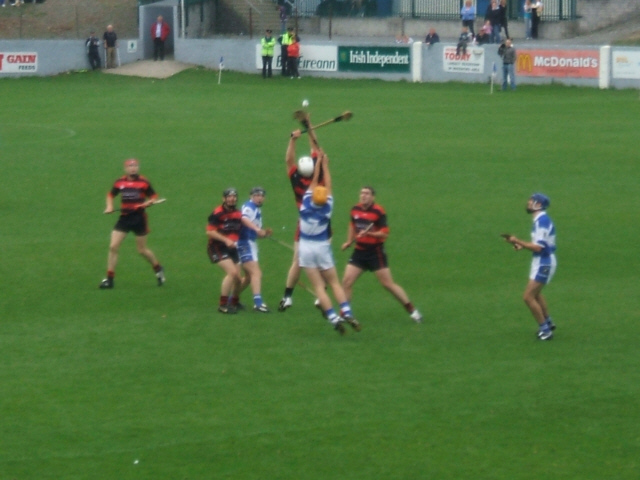 This entry was posted in Hurling, Waterford and tagged Ballyduff Upper, Ballygunner, County Championship on 04/11/2007 by deiseach. Paul Flynn is going to miss next Sunday’s county final with an ankle injury. While this is bad news for Waterford fans as it brings the evil hour of his retirement ever closer, this is surely good news for Ballyduff Upper as they bid to prevent Flynn winning his 245th county title. Okay, it would be his eighth, but it feels like more at this stage. Can you sense the longing for a different name on the county cup? 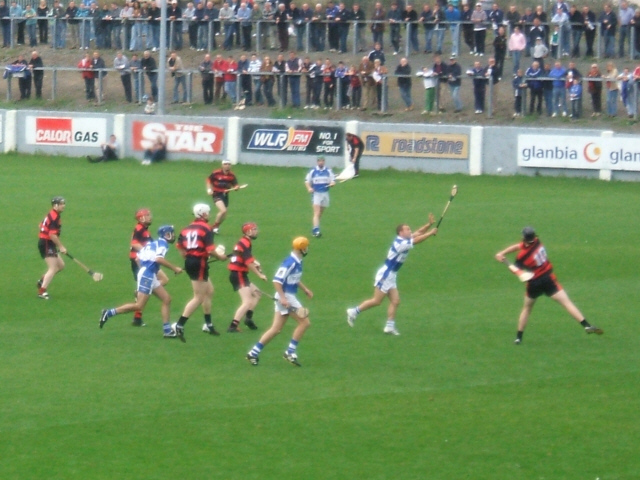 This entry was posted in Hurling, Waterford and tagged Ballyduff Upper, Ballygunner, County Championship on 30/10/2007 by deiseach. Quote of the month, if not the year, went to my dad on the train back from Dublin yesterday. Ten to eight, and already I was checking how Stan and the boys were doing against Germany at Croke Park. “Why are you bothering,” says he, “don’t you know it’ll be 0-0? Don’t you know it’ll be 0-0 in an hours time?” A comment born of his less-than-glowing attitude to soccer, but it was eerie in its presience. And what better way to ram home the point than to agree to accompany me to the replay between Mount Sion and Ballygunner, where it was most unlikely that the score was going to be 0-0 to 0-0. As it was, what transpired was only marginally more entertaining, as an astonishing three-goal salvo in the first ten minutes sunk the defending champions before they had even had a chance to raise the periscope to survey the danger. Each goal was more morale-sapping than the last, the first allowing the Ballygunner forward (no team sheet could be found) to waltz through the defence and score with a shot that Ian O’Regan in the Mount Sion goal really should have seen coming; the second seeing the Mount Sion defence going AWOL, the Gunners nearly screwing up as they had acres of time and space to walk the ball into the net; and the third from a free, a well-struck one but surely one Monastery man could have put a stick to it as there were enough on the line to form a scrum. When another speculative effort on goal from a free arrowed home – Ballygunner’s forward clearly spending his days well with The Master – the match was done and dusted. Having not been at a senior club match in all of eight years – the 1999 county final, when the Mount Sion juggernaut flattened Ballyduff Upper – this was a case of dipping my toes in the water. I can certainly see myself doing it again. The bone-juddering intensity of hurling is still there at the lower levels, even in a match as anti-climactic as this one was. So I’ll be back, in the sense of being back to Walsh Park, where it’s a case of short journey in, easy parking, no hassle getting a ticket or a seat (can’t have been more than a thousand at it) and a quick getaway at the end. Heading down to Dungarvan or even further afield for the Munster club championship, should we be in it? I don’t think so. 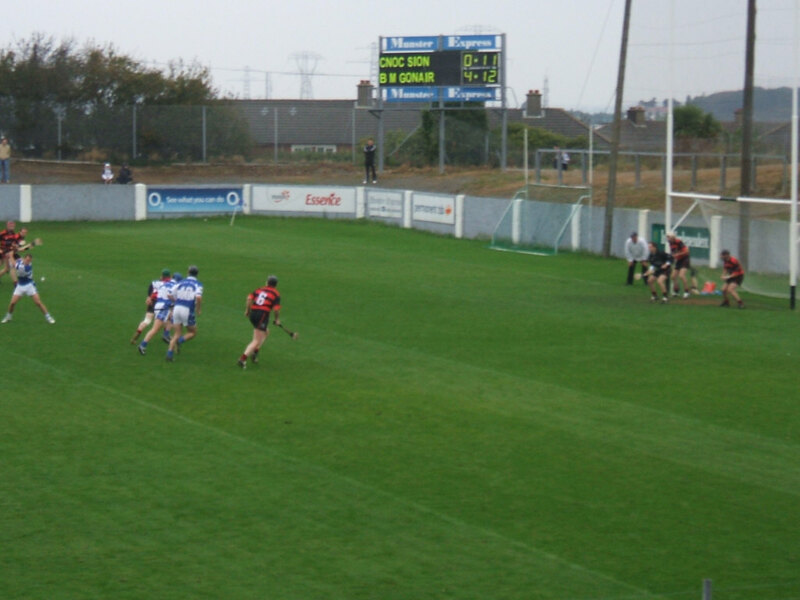 Speaking of Dungarvan, it is there that Ballygunner travel to play Lismore next weekend in the semi-final. As per previous comments. Lismore shall have my full support (in spirit). And should they fail, Ballyduff Upper shall have my full support, they having secured the honour of being my backup to slay the other head on the Waterford hurling Hydra that is Ballygunner by defeating Abbeyside in a nailbiter on Saturday night. Fingers crossed. This entry was posted in Hurling, Waterford and tagged Abbeyside, Ballyduff Upper, Ballygunner, County Championship, Lismore, Mount Sion on 14/10/2007 by deiseach. This entry was posted in Hurling, Waterford and tagged Abbeyside, Ballyduff Upper, Ballygunner, County Championship, De La Salle, Lismore, Mount Sion on 08/10/2007 by deiseach.